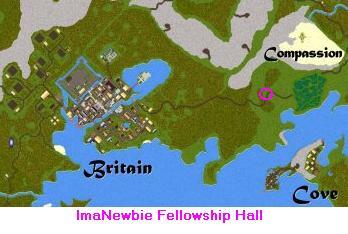 The ImaNewbie Hall is located a short run East of Britain, right on the main road. If you do not know who ImaNewbie is, then you are probably a newbie yourself. His comic adventures are a classic in Sosaria. The hall has a nice tavern downstairs, with 2 rooms devoted to room libraries as well. The Tavern is the Drunken Dragon Tavern run by Perigrinator. There are some training dummies, ovens, looms, anvils, etc etc for your every need.